All-Pro and Pro Bowl Age: 23 or less 100% of Multiple All-Pro and Pro Bowl QBs since the 1983 NFL Draft Class were at most 23.32 on Draft Day. We are finally here. The crown jewel of the NFL Nile. The Senior Bowl, and just like every year the media and draftniks get tons of information on prospects from height, weight, arm length and hand size. But they rarely know what to do with it. Other than making sexual innuendos about how big a prospect’s hands were, or making a point of criticism about a player when it could largely be unwarranted. But that’s why I’m here. I spent over four years gathering various measures and actually seeing what the significance of each number is. Not relying on the kindness of anonymous strangers. Which is what most do when it comes to these type of things. So here it is. Dark Green: Means they passed with flying colors and share data traits with every Multiple All-Pro player at their position in more than a decade. Light Green: Means they passed with very good colors and share data traits with every Multiple Pro Bowler at their position. Blue: Means they passed the minimum threshold for a long-term starters at their position. Red: Means there have been 0 long-term starters with that particular data trait. It’s a big red flag. I hope this clarified everything as best as possible. Let me know if you are confused in the comments below. Additionally, here is the Periodic Table of Football Elements. It has the highest to lowest numbers for long-term starters at the position. It doesn’t help with identifying quality, but quantity. 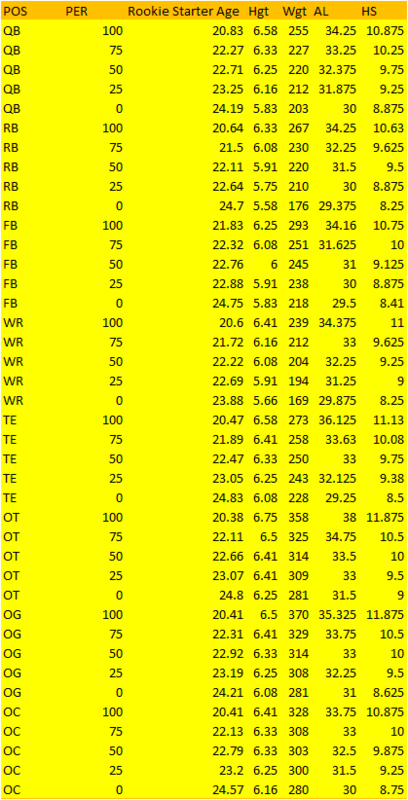 And gives you some perspective on who is above average or below average in terms of the measures at the Senior Bowl. But remember that being the biggest, tallest and longest player doesn’t always mean you will be the best. Lastly, I want to make a big shout out to Eric Galko, Dane Brugler and Trevor Sikkema for leaking the information I used for the spreadsheet on their twitter pages. I wouldn’t be able to make the spreadsheet without their help. Just as the Shrine Game before, the spreadsheet here nflpa-measurements which holds all the weigh-in results and a general highlight of players who missed or hit certain thresholds. Dark Green means they hit an All-Pro mark. Light Green means they hit Pro Bowl marks. Blue is starter. And the numbers in red mean they didn’t hit the minimum number for a starter at the position. I’d also like to credit draftcountdown.com for leaking the numbers. If you have question let me know @Jimetrics, or leave a comment below. I had an absolute blast in St. Pete checking out all the future NFL draft prospects at the Shrine Game practices. But every year there will be winners and losers from the Shrine. The winners usually get a late call up to the Senior Bowl. And the losers may go on to be very good NFL players. However, you must make the most out of every opportunity given to you in the draft process. Something as simple as forgetting your gloves last minute before a Pro Day can leave a lasting impression throughout the next couple of months for better or worse. So let’s get onto the winners of the Shrine practices and players who I believe should get an invite to the Senior Bowl. Starting with the quarterbacks, I was most impressed by Alex Torgersen based purely on talent. The Pennsylvania product showed good arm strength and the most consistent accuracy throughout the week. He was trying a little too hard to impress at the beginning of the week. But once he settled down, he made some impressive throws. Almost all of the QBs here threw a beauty or two, but I like consistency over flash when it comes to quarterbacks. Which are similar qualities I like at running back. Michigan’s De’Veon Smith and Utah’s Joe Williams were the two most impressive backs here. With Smith standing head and shoulders over the competition in terms of competitive spirit and a surprising amount of pizazz in receiving drills. Smith left the biggest impression on me as a prospect who wants to get drafted in the all the right ways. And I wouldn’t be surprised if this turned a late Day 3 to UDFA “generic power back” into a Day 2 to early Day 3 prospect when the draft process ends. With similar things I could say about Northwestern’s Austin Carr, Washington State’s Gabe Marks and California PA’s Billy Brown at wide receiver. Now I brought a lot of film baggage here with Carr, but he had some of the most impressive hands and was a very smart player throughout the week. While Gabe Marks was an extremely vocal and tenacious player as well. Billy Brown at 6-3, 250+ pounds may be an H-Back tight end in the NFL, but he showed great body control and the ability to make tough contested catches all week long. At TE, Toledo’s Michael Roberts already received an invite to the Senior Bowl earlier this week, but it’s Drake’s Eric Saubert and Laval’s Antony Auclair who were the most intriguing to watch. Saubert in particular displayed soft hands, the power to break tackles and his blocking improved throughout the week. He was able to block Trey Hendrickson 1v1 at various points of the week. Which should tell you everything you need to know about this Drake prospect. He’s got the goods. On the offensive line: Oregon State’s Gavin Andrews, Florida International’s Dieugot Jospeh, North Carolina’s Lucas Crowley and Wyoming’s Chase Roullier fit the bill. It was tough to come down to those four names, but they showed the best moments of power and balance. Furthermore, Jospeh stood out the most as a future tackle prospect. He has a ways to go in many areas of his game. However, he shows the basic foundations of a solid punch and balance to serve him well with the right coaching. On the defensive line, despite Florida Atlantic’s Trey Hendrickson having lots of issues with the mental side of the game. He was the most unblockable player all week long. Northern Iowa’s Karter Schult finally started to put it together on Wednesday, but Hendrickson was a force from the jump. I will have my fair share of fights not including Indiana’s Ralph Green, Florida’s Joey Ivie and Youngstown State’s Avery Moss even. But the man who flashed the most this week on the defensive line was Trey, and he at least deserves to show what he can do against Senior Bowl competition. The linebacker group was the weakest group at the Shrine. Each had their moments and my favorite was Calvin Munson of San Diego State. However, it was brutal to watch them try to cover in space. An area that will be even more brutal at the NFL level. I simply can’t in good conscience nominate anyone who I feel will be brutalized next week in receiving drills. I learned my lesson from Marcus Smith in 2014. However, the Shrine’s secondary prospects offer a wider array of players to choose from. Starting with North Carolina State’s Jack Tocho. He was the most impressive cornerback in terms of movement ability in drills. Tocho has the full package of size, hips and explosiveness to impress in Mobile. But I can’t leave out Missouri’s Aarion Penton or Oregon State’s Treston Decoud. Penton was the biggest ball hawk with the least impressive measurables. While Decoud had the most impressive measurables and was a decent ball hawk in his own right. My gut tells me that Decoud will likely get the invite over Penton. However, Aarion will have a huge impact in the NFL as a team’s number one nickel cornerback. Penton’s instincts popped on film and were easy to see in practice. I won’t forget his competitiveness this week and will view him as a cheaper option to those who don’t want to pay Jourdan Lewis’ price tag. This marks the end of my impressions from the 2017 Shrine Game practices. It was an awesome experience and one that I will never forget. But it’s important to remember that whatever happened in the Shrine practices should serve as the cherry on top of the evaluation process and not the cake. These practices can leave an enormous impression on scouts and teams that they subconsciously don’t realize affect their grades. Don’t let that happen to you. Be conscious of your own biases. While always going back to the tape and listening to the questions raised from data. Tape and data will always hold more weight than one week of practice. If you remain vigilante in that simple fact. You will see the Shrine and Senior Bowl practices in a proper light every season. With that I’m onto the Senior Bowl next week. I will attend a few of the practices. But I will be sure to provide proper breakdowns for the measurement data. And will be ready to tackle the NFL Combine in no time. So be sure to follow me on twitter at @Jimetrics and leave a comment if you have any questions about the Shrine or the NFL draft coming up. Here is the spreadsheet for the confirmed 2017 NFL draft underclassmen who declared early. I included available age and production tests. Each production score is out of 100. And each position has different thresholds for quality and quantity outcomes. So feel free to leave a comment if you are confused by what the significance of the numbers mean.